The half scale saga continues. It's always nice when you reach the point in a project where you see things coming together and it no longer seems like an insurmountable task. And I apologize if you're actually interested in building this kit and you think I have left out key information. I have. But I only realize it as I write and have an "ah ha" moment. It's a bit disjointed. I'll make a nice summary post when I finish the kit! First, I picked this bad boy up at IKEA. The Ikea PS 2012 Coffee Table has made my mini life much, much more enjoyable. It was a well spent $49.99 plus the family breakfast we had. I can put my current project on top, load some bins with the items I need and place them on the lower shelf, then push it from the furnace room to the family room. Much easier then lugging the house and making a million trips back and forth. It's metal, it's sturdy and it's on castors. It's heaven. The iron-on veneer worked pretty well overall. A few spots seemed a bit loose after I stained so I lifted the areas and applied some glue. Trimming the veneer to fit around the doors curve was a lesson in patience. The house needed something, anything, architectural. It came with trim for the sides of the house. I used it, but trimmed it so it fit properly, not like the instructions suggested. The upper portion of the sides needed interest, so I used vertical strips of balsa. 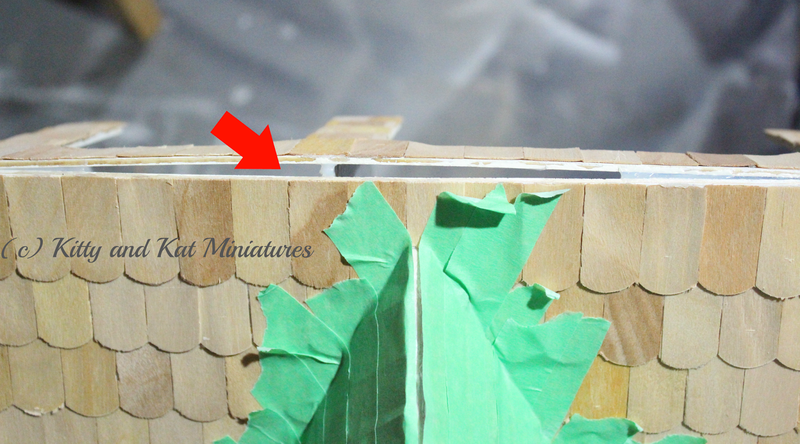 Much angle cutting and wood filler were used. The original front of the house, under the roof line, had 2 port hole windows. These are horribly placed and just weird. There would be nowhere to place furniture. I never punched them out of the front plywood. 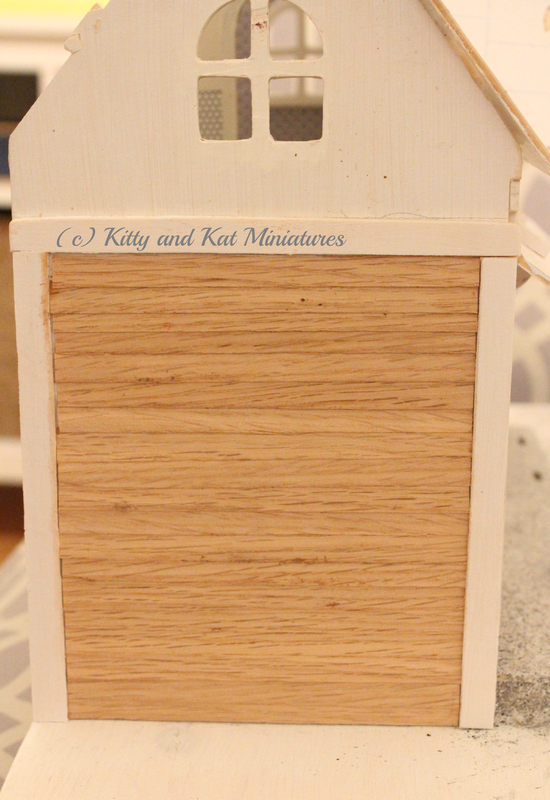 Instead, I added rectangle pattern on the front using balsa strips. I used Minwax Grey as the stain. I made a happy mistake. Well, a lazy, tired mom mistake for someone who likes to refinish furniture and is well versed in stain. I didn't use a stir stick and scrape the bottom. So, the stain came out multi shades of grey as I applied it with a brush. Usually I dab with a paper towel, but this is waaaay to small to try that. I liked the multi toned grey mistake so much I decided that it looked weathered. But if it's weathered, you have to go all the way. I sealed it with a satin clear polyurethane. 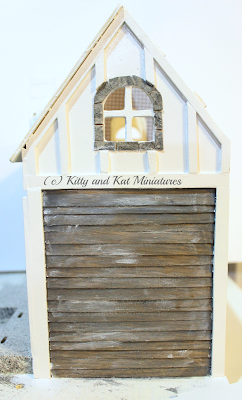 Then I dry brushed on some white primer to age the siding. 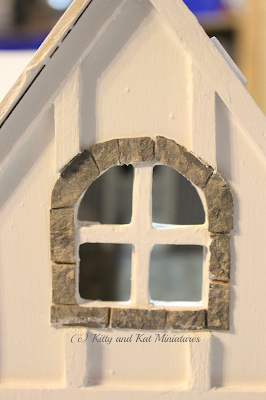 For the windows, I chose egg carton stone as my trim. I didn't use a plaster grout, I just painted in the grout. I thought the grout would crumble away with aggressive play. 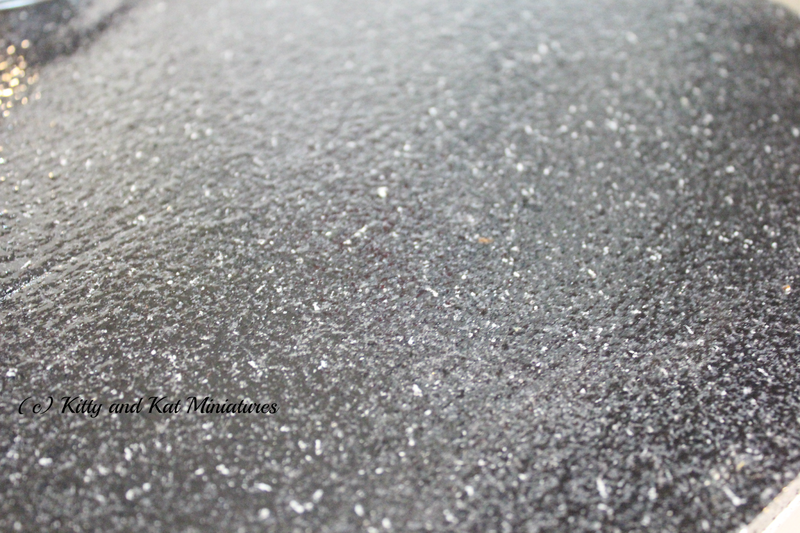 The "stone" was sealed with a flat spray paint clear coat I applied with a brush. The front door was rubbed *cough* purposely with the grey stain. I was going to age it, but the stain just happened to help. This was an adventure! While at a wedding in Kingston, Ontario, I stopped at a hobby store. I averted my gaze from dollhouse kit on sale there and grabbed some 1:12 scale Greenleaf wood roof shingles. 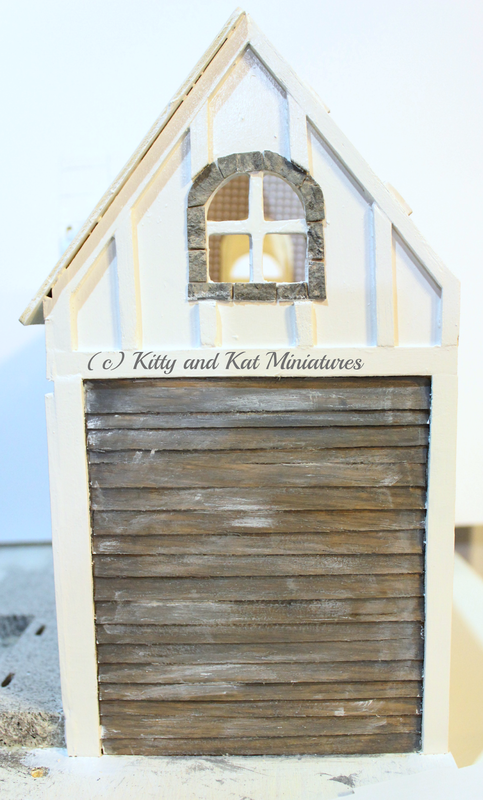 The kit has shingles drawn on to the roof. But that wasn't appealing. They were sized for 1:12 and rather then hunt for 1:24 roof shingles, I said good enough! And went on roofing. I used LePaige No More Nails to apply each shingle. Then I used green painters tape to hold 2 rows of shingles down at a time. This ensured they would dry as flat as possible. It mostly worked! Notice the picture with the large roof gap? That's that happens when you jam a kit together that doesn't fit very well. The kit comes with gingerbread for all the roof peaks. I wasn't keen on them because it a) isn't the nicest gingerbread and b) delicate trim and kids likely leads to breakage. 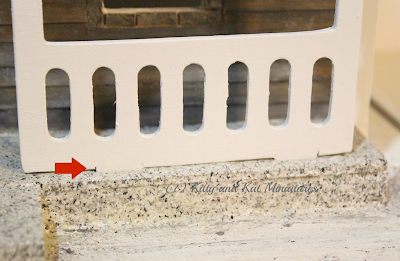 Instead I used 2 different sizes of square wood dowel to finish these gaps. When I installed the porch I could see a hint of the tabs as they sat in the holes of the porch. This would not do. I grabbed some wood trim me hid the issue. The porch roof was a bit tricky to slide into those ugly 4 protruding tabs. 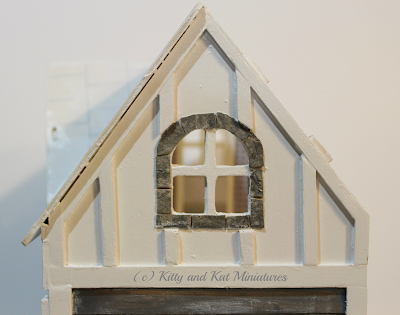 Thankfully, the gap between the roof and the house was hidden by shingles. Any remaining gap after the roof is finished will be filled with caulking. Ugly visible tabs - this will not do! The garden beds and walkway trim were added in. No real rhyme or reason, just liked how I placed them. I've purchased some sand and foliage to fill in the beds. I have to give a bit of thought as to how to secure the foliage, but I'm leaning toward construction adhesive, the king of adhesives. The grass has been ordered on Ebay....hopefully it arrives. The house is sitting on a pine board, but under the house I laid about a 1cm square wood dowel in the foot print of the house and a few support pieces running front to back in the Center. The house itself has about a 1cm+ gap between the walls and the floor underneath (the walls drop down past the floor on the exterior), so you need to fill the space before you can mount it to a base. I did take pictures.....but I can't find them. Sigh. 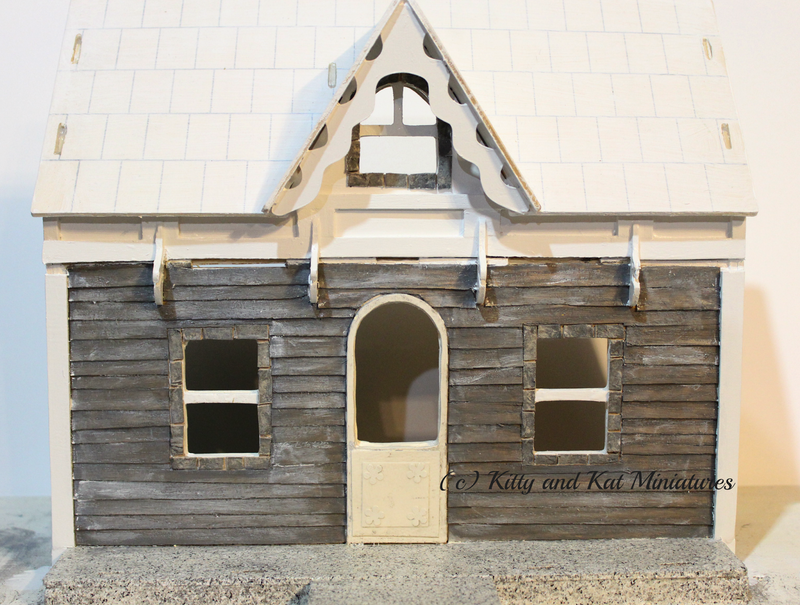 I am planning to fix up the garden, finish the roof, door hardware and waste tons and tons of time making a mailbox and house numbers. And then there is the interior. Another day, another glass of wine! Thank your for everyone's kind comments on my last post. 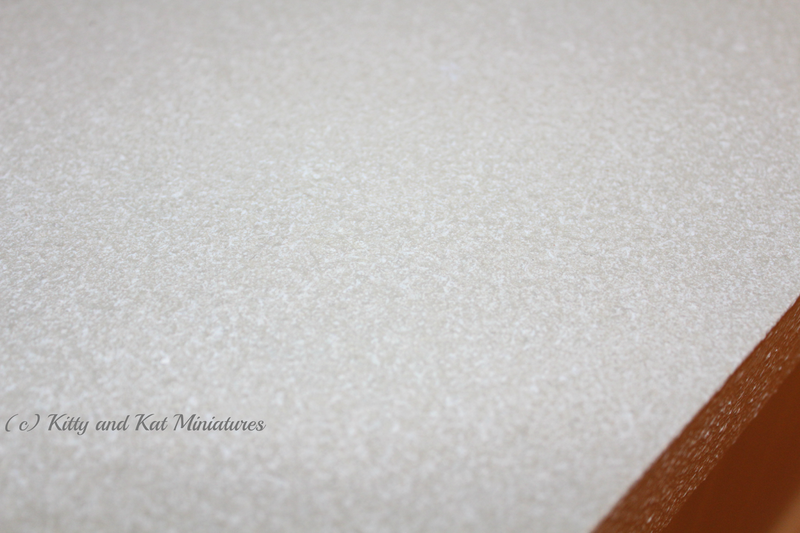 I saw there was an interest in stone effect paint, so, having used it a few times with varying degrees of success, I thought I would discuss a bit more! I purchased mine at Home Depot, but I've seen it at many other hardware stores and even arts and crafts stores, such as Michaels, Desseres, etc. Its also readily available online. 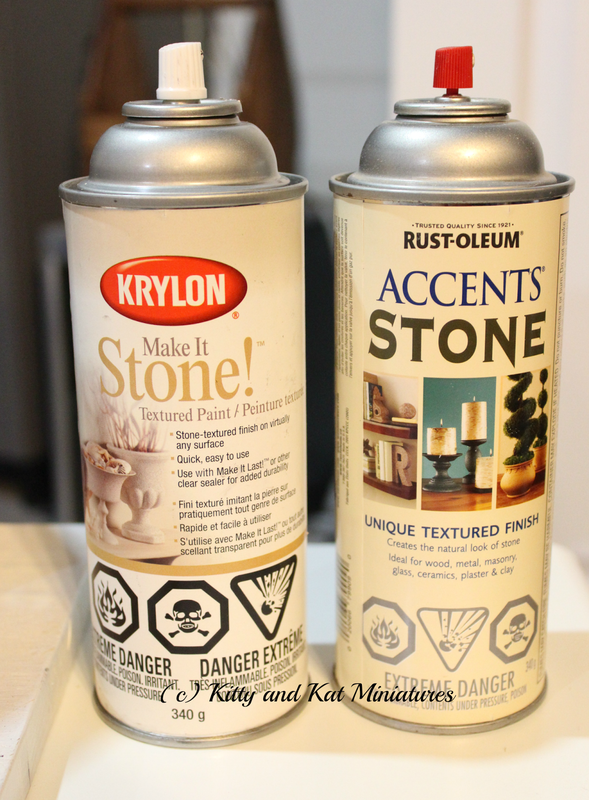 Having now taken the time to look at the cans, it was Rustoleum I used on my laminate counter top and my work station counter, not Krylon. Maybe this was why I was annoyed with Krylon. The paint itself is fibrous. Each grain of texture it spits out is a different colour. It's hard to describe, so do a test spot and touch it. It's weird! Krylon has larger fibres then Rustoleum. 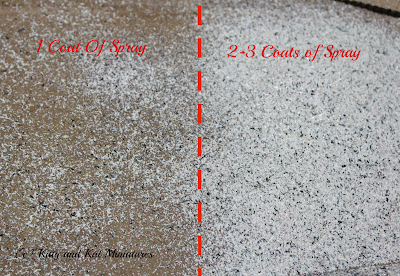 With any stone spray you should base coat your surface with a similar colour to your stone spray. 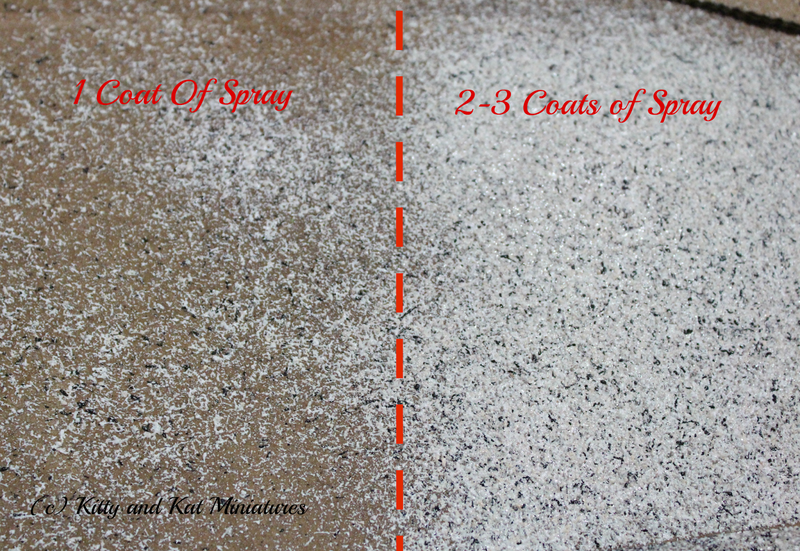 The spray itself is fibrous, meaning, it will build up in one spray and could look like a wool coat on any mini surface. Light coats, maximum 2 coats should be your aim. If you linger in one spot when spraying, you will likely get a glob of goo (build up) so beware. Having used the medium tone stone on the half scale porch, a black granite on my work station counter, and a light sand colour on my counter top, I have to say the lighter the colour the more realistic the stone effect. Tape off or cover any surface that you don't want covered, and remove the cover quickly after you finish. When I pulled away the paper I used to shield the house from the painted porch, I removed some porch paint. Oops. Don't do touch ups then! You will mess up the fibers and it will look like a bigger mistake. Come back after its dry and re spray. If it looks bad when you finish, just wipe it off when it's still wet. It comes off easily at that point. 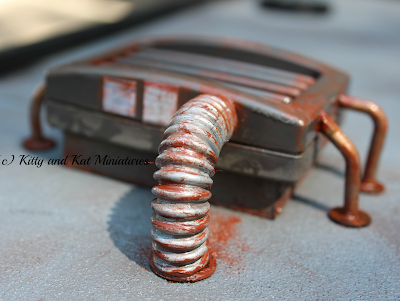 I sealed mine for safety sake, but the finish is a satin to semi gloss straight out of the can. Do a practice run with the paint!!! I have been dragging my feet writing about this project. Not to mention the slow pace with which I am progressing with it. I'm getting there, but slowly. very sloooooooly. 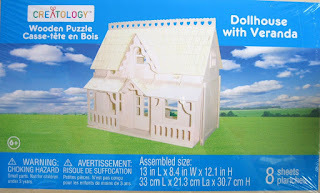 I purchsed the Creatology and/or ArtMind puzzle dollhouse kit at Michaels. There aren't too many mentions of this kit anywhere, one on Flickr and a few other blogs, but not much content for a pretty common kit. I have now taken it upon myself to work my way through it and describe how I wanted to burn it to the ground at times. This will be a gift for a special little lady, so I had to make it safe for wee ones, therefore some of the finishing might seem excessive, but I need it to be smack, bang and stain proof! The kit is roughly 1:24 scale, give or take. It's inexpensive, but solid plywood. You just need to pop it out of the scored sheets. I primed it all first while in its sheet form for ease. Then I extracted pieces as I needed them. It fits together with wood tabs. "Fits" is a bit of a loose term once you prime and add a base nothing bends and jams together anymore. 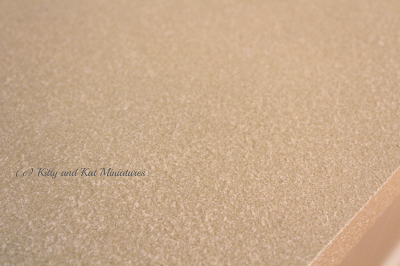 Get the craft knife and sandpaper ready to get those tabs and slots to work together! I ended up papering and laquring all the walls before I assembled it. This was much, much easier then doing it with walls up and glued in place. Its a small house! I also lay the floors too before assembly. This ensured the floors were well pressed and the floors flat. 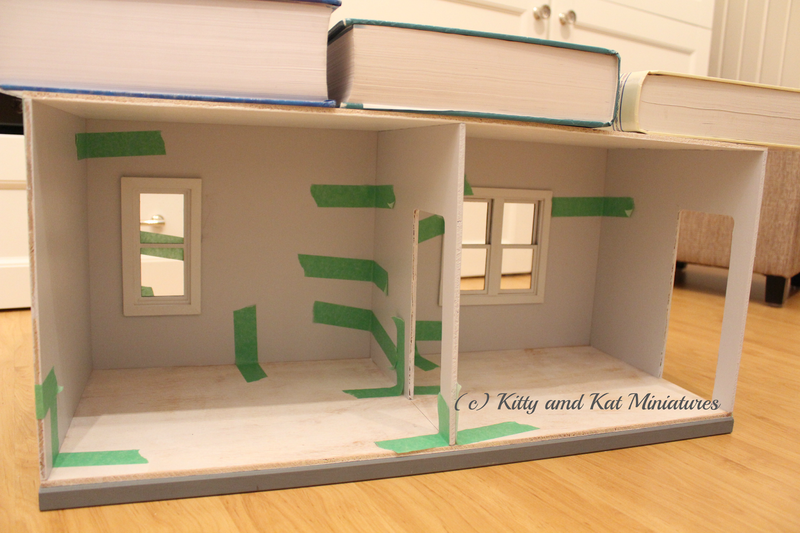 I just made sure to trace the footprint of the walls on the floors before I started gluing to leave room for the walls to slot in. Given the 1:24 scale, I knew popsicle sticks would be too large. For $1 at the dollar store, I bought a mammoth bag of coffee stir sticks. Extra long, so you need fewer....except half are warped and weird, so you almost need a bag to make the floors work. The wood was then cut in various lengths and stained grey. You might recall my grey wood floors from some of my mini scenes earlier this year. I glued the floors down using LePaige No More Nails. 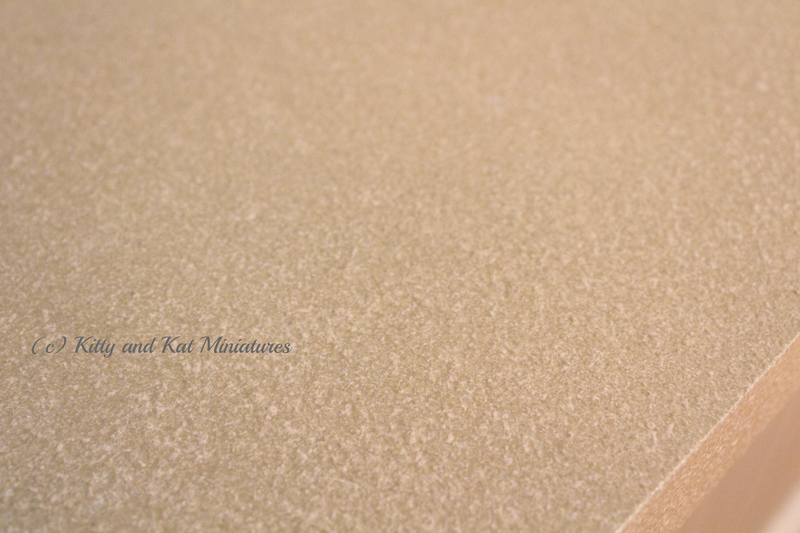 I love this stuff because it dries rock solid, but it has a low moisture content so you don't get warping. But NOTHING will ever pop off ever again. I used a book to press it down as I lay and glued boards. The kits instructions suggests putting the door and trim on the exterior of the house. But I want things to look nice on both sides! 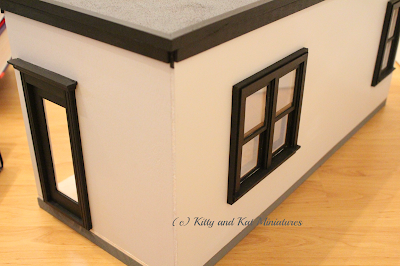 I used the window trim on the inside. For the exterior, I am making stone trim for the windows. As for the door.....not such a fan. I wanted a large opening to let light in. So, I cut the window panes out of the door. 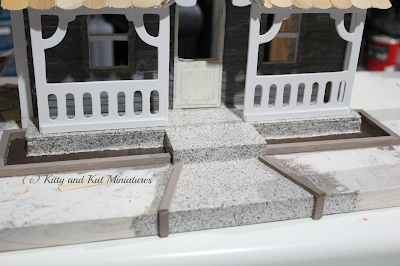 But I needed a second door frame for the exterior too, so I cut a mirror image from balsa using a craft knife. There was no trim supplied for any of the interior doors. 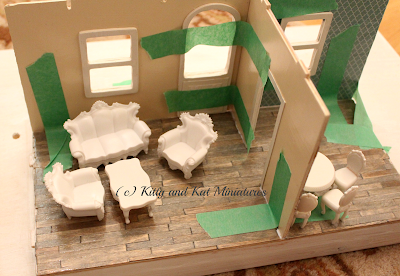 That just would not do, so I used a thick cardstock and cut out the need shapes and glued them in place. 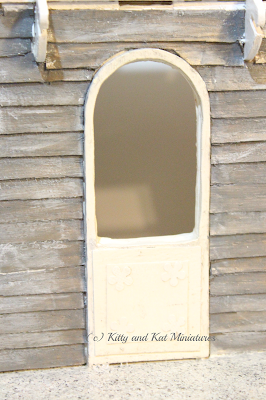 I added a panel to the door using cardstock and some flowers from a punch. All the trim and doors are painted Antique White by DecoArt. The walls were all glued in place using No More Nails. Word to the wise, be prepared to whittle and curse, because this isn't the best fitting tab walled house out there, so once you glue it, nothing on the second floor or roof really fits like it should. Thankfully, I still have all my university textbooks which are amazing weights. When the tabs were finally whittled to fit, but nothing stayed together, glue and the weight of the books worked! I wanted to make a proper stone porch and walk from egg carton. Then I did the entire process for my room box and realized I was insane for wanting to do that again. Solution? 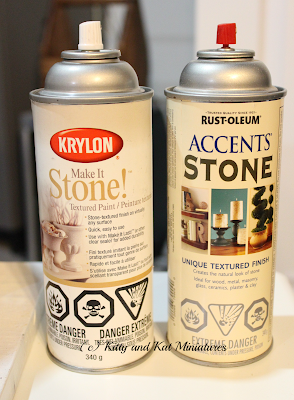 Head to Home Depot and purchase a can of Krylon "Make It Stone." Normally, I hate Krylon, but this product is ok, and I've used it before with success. 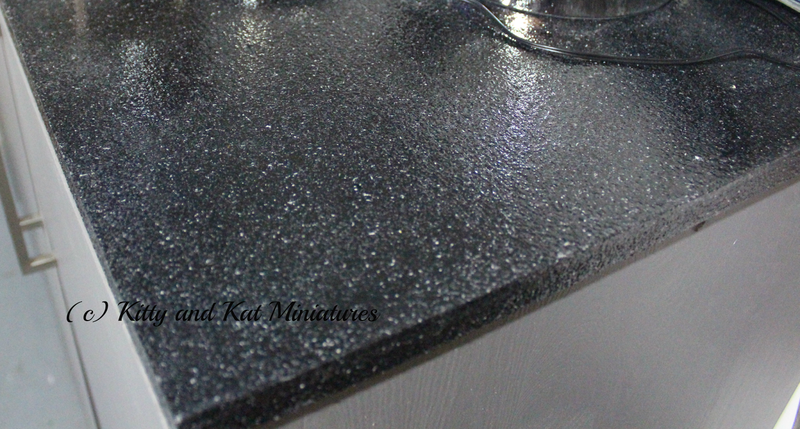 Side note: if you ever want to redo a minimally used laminate counter top, you can stone it! Lemme know if you're interested. 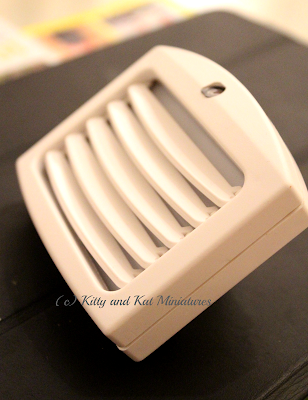 I sealed it with a gloss water based polyurethane for durability. Who doesn't like wood cladding on a house? But, who also likes to make a build more difficult? ME and ME!!! I made it a bit easier. I purchased Bennett brand iron on trim veneer. Using my now trusty "craft" iron (aka the iron I ruined with iron on hemming and can't use on shirts), I ironed on the strips of wood. For the most part it glued down and held. After I stained some loosened and another go with the iron didn't help. So, I glued and pressed and all was well. I've progressed further along, but I haven't done photos. I thought I had, but looking at my camera it was apparent that "thought" and "did" had not met at the point known as "reality." So, more to come. Also, I stoned my entire room box exterior. That I actually took pictures of thankfully. 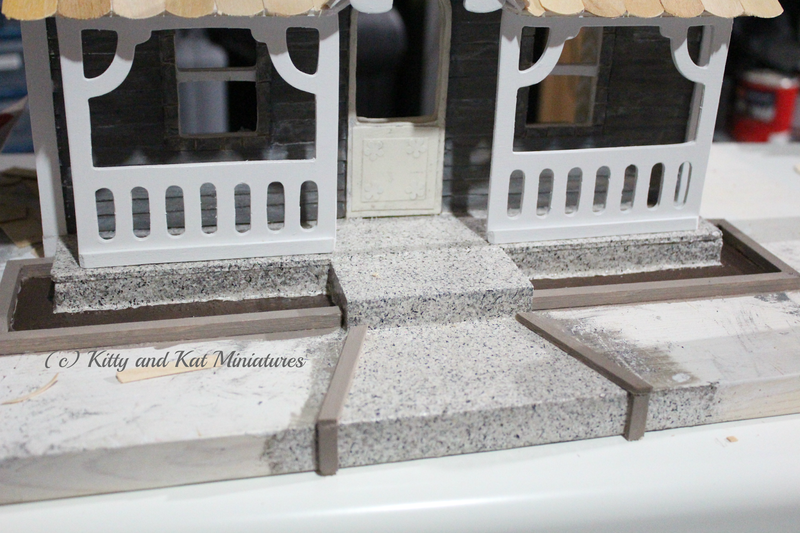 I'm trying to push a head a bit with the half scale house before I blog the stone process and tackle the floors. I purchased the veneer sheets for it, which stare at me daily. I am always in awe of the creativity of Pepper, Brae and Elizabeth. They are so creative and I often just sit there and think, one day maybe I can be that creative. So.....I gave it a shot! The room box continues to grow in its production value. 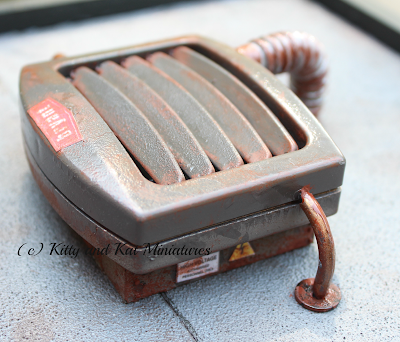 A little of this, a little of that and now I'm making an air conditioner for the roof top. Where do you think I started? Why of course! The dollar shop (Dollarama to be exact). $3 later and I found my victim...or future air conditioning unit. I either wanted something with fans or louvres. I found the latter in a night light. I unscrewed the nightlight and took the electronic bits out. 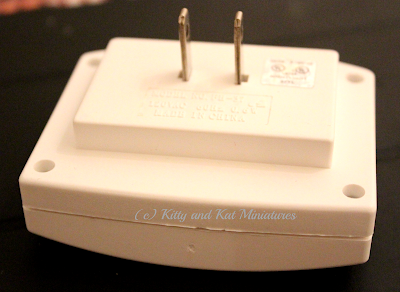 Then I used pliers and pried off the metal plug prongs. This left me with 3 pieces, the top (with the louvres), the bottom and a plastic plate in the middle (that goes under the louvres). I spray painted them all with grey primer and then used the anodized bronze on the top and bottom pieces and the gloss black on the middle plate. 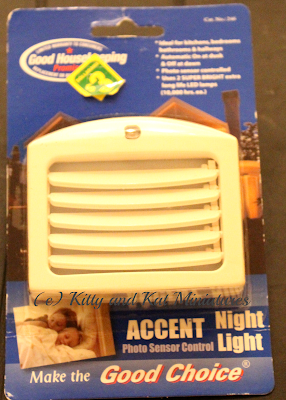 Below are pictures of the night light. 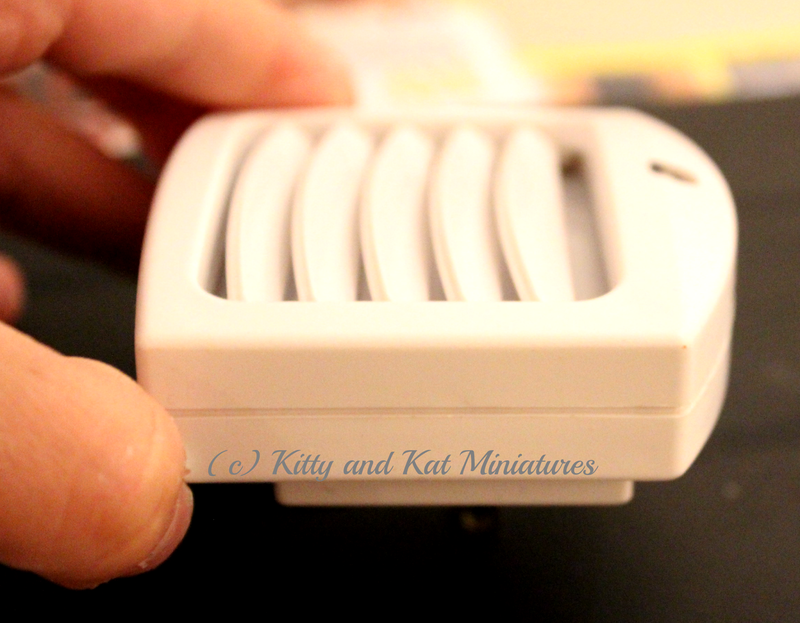 I reassembled the night light fully painted. The louvres no longer moved because the paint put them in a fixed position, but I had placed them at the angle I wanted before. The night light didn't really come with a convincing "base" that looked like an air conditioner, so I grabbed some scrap wood pieces and built a little box for it to sit on. It too was painted anodized bronze. 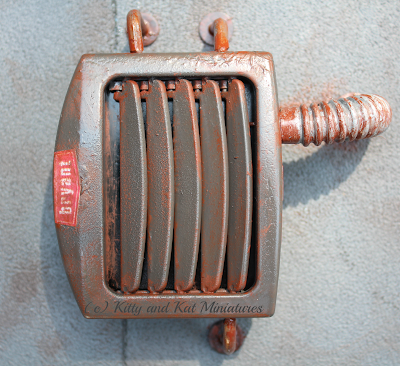 Air conditioners have pipes, most often copper pipes, feeding into it. 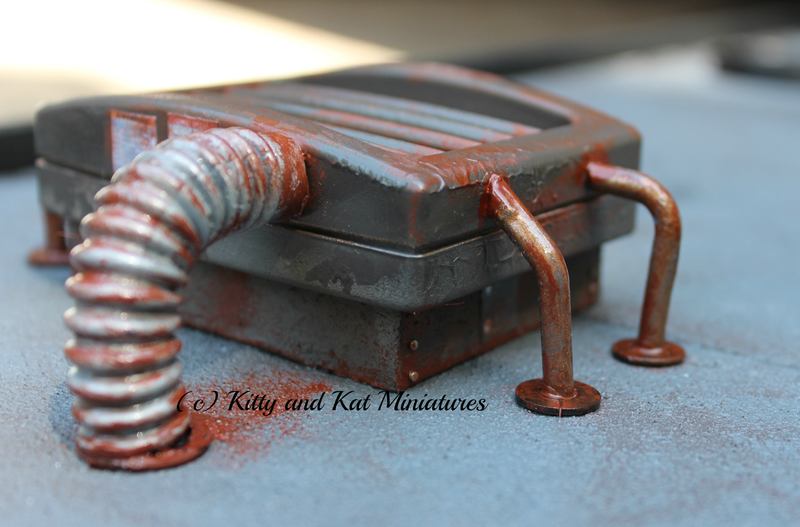 And some Google image sleuthing of industrial air conditioners showed some larger pipes, hence the ribbed plastic tubing I used. The "pipes" were all spray primed. 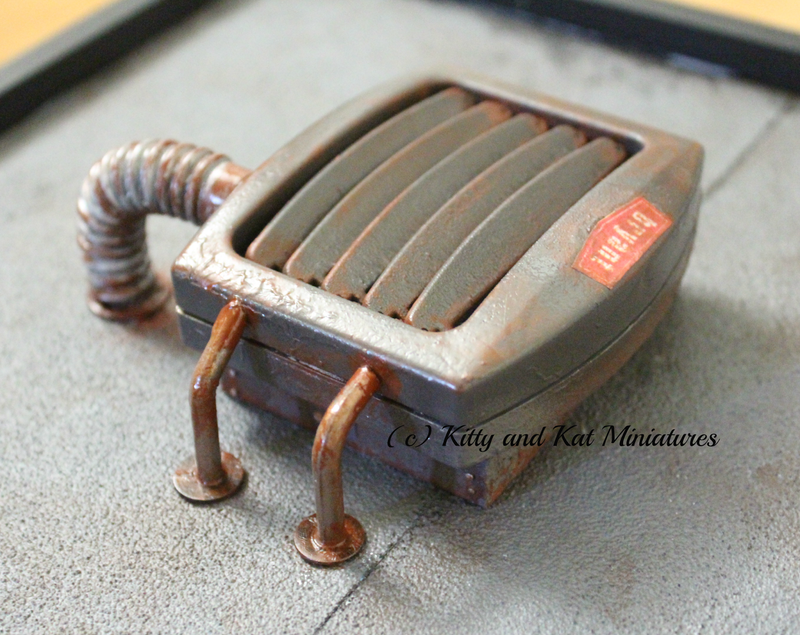 I didn't have copper Testors paint, but I figured brass + rust paint = close enough. 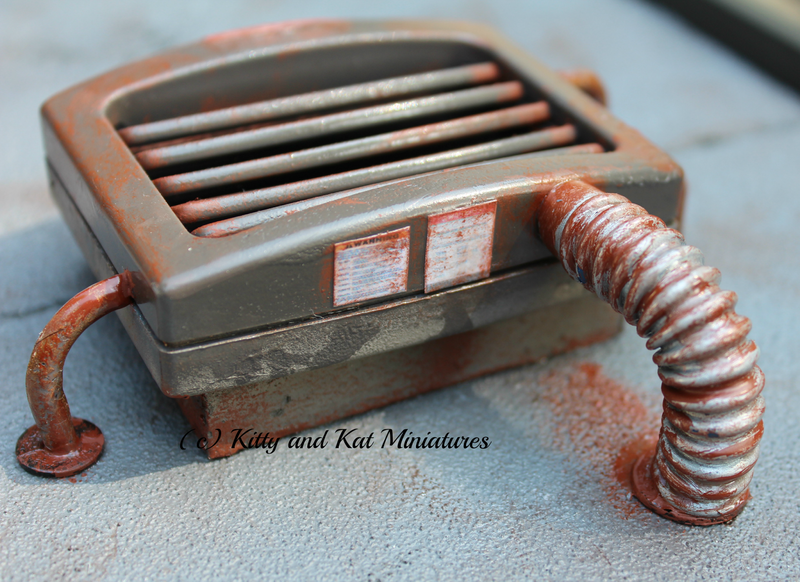 They sat on metal washers that I sprayed gloss black and "rusted." The ribbed plastic tube was painted flat aluminum. But getting it to hold in place with just glue seemed impossible just looking at the tubes bending properties. Solution? Push pins/thumb tacks. I drilled a tiny hole into the air conditioner and into the roof. I cut the pin short on the roof side so it wouldn't go through the ceiling. 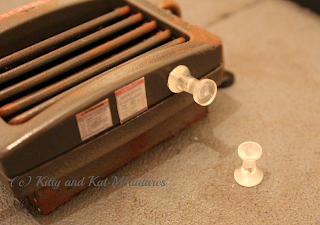 I filled the ends of the "pipe" with quick set glue and placed them over the thumb tacks. The wood base has rivets which are actually finishing pins. 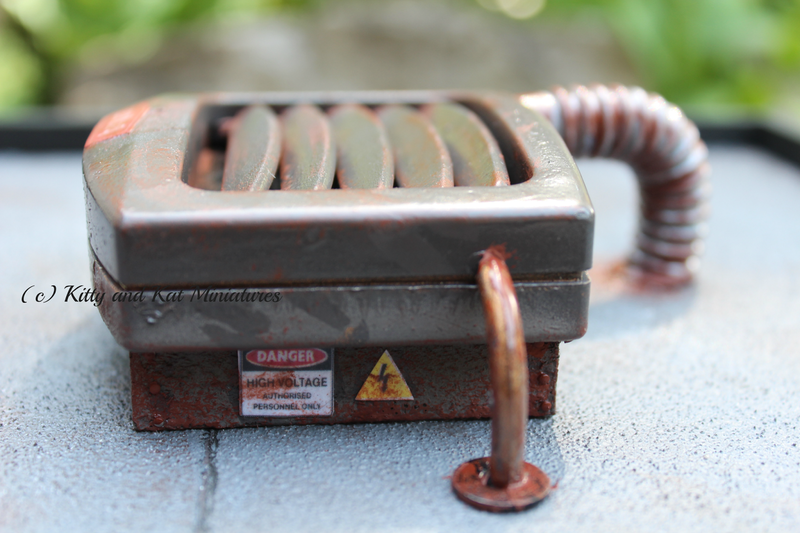 The labels were the Google result of "industrial warning labels" that I shrunk down in Word. The "Bryant" label actually worked nicely with the lines of the unit. 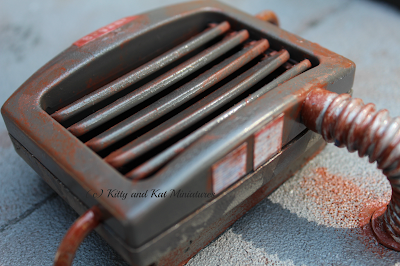 I then "rusted" everything with paint. 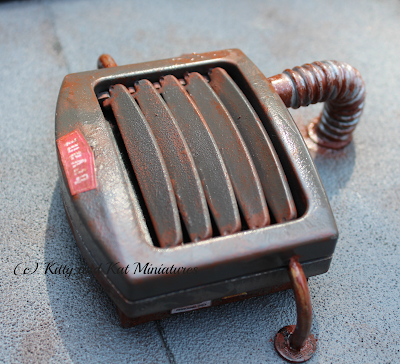 But not too rusted. So there you have it! 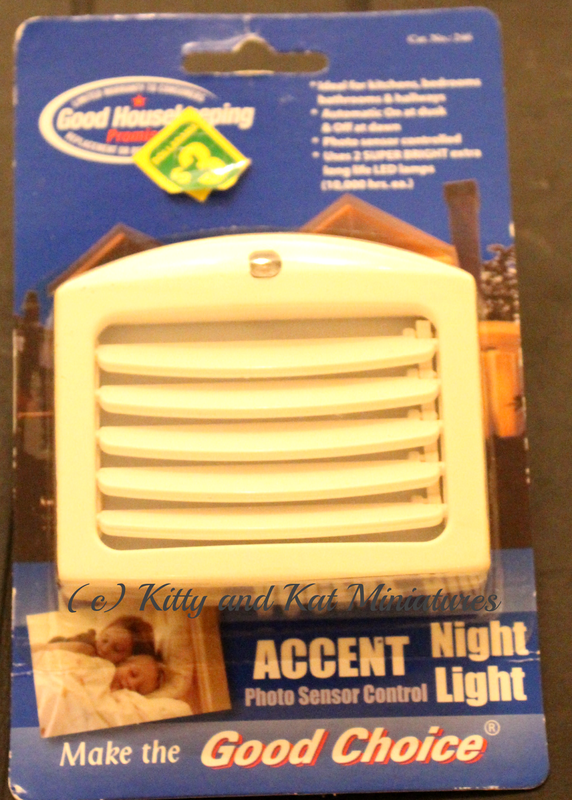 An air conditioner from a night light. I like it. 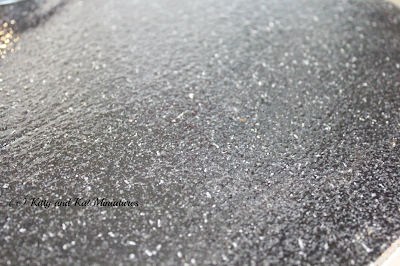 And I even took pictures of it outside which actually made my photography editing less of a headache! Have you ever started a project and it took on a life of its own? Either because you let it snowball unintentionally or you said @#%$ it, lets do it!!! I took a little from column A and from column B on this one. As previously mentioned the Houseworks Double Room Box is supposed to serve as a simple place to have fun and stage scenes while I labour away on larger projects. Ha. As if I could do something "simple." The window issue was solved. The box is now mounted to a base. And I have progressed past some of this posts content. I also have issues with writing posts, because every time I edit pictures and get ready to write, I do more work on the room box and think, wait, included this too. And I never get to posting. Sigh. 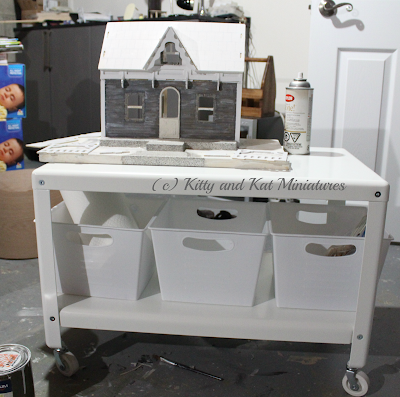 Since I haven't found anyone else detail out the assembly of a Houseworks Room Box, I decided to make it a more detailed step-by-step post for anyone attempting one or those of us who have never made one and want to take a stab at it. The walls are 1/4 inch thick and the Houseworks windows are 1/2 inch wide. This means the windows are WAY to thick for the walls. I whined, I cried, I wanted to scream. But I fixed it. 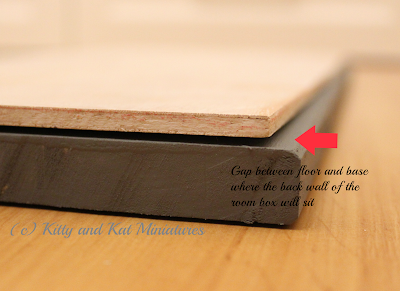 I used some 3/32 inch wood from Michaels and made thin strips, in addition of other wood trim I had on hand. 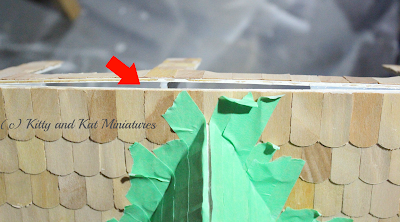 I then glued these strips to the back of my interior window trim, wood filled and sanded my interior trim gap issues away. 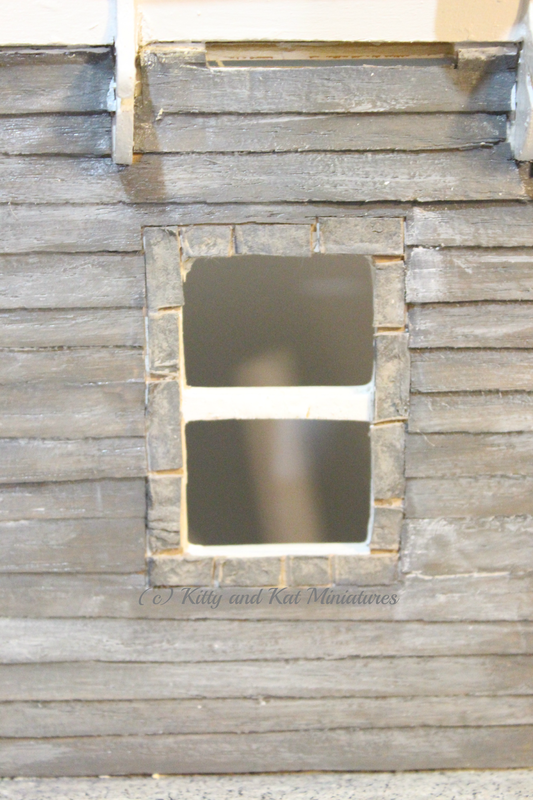 On the exterior, I used 1/4 inch square wood dowel all the way around the inside of the exterior face of the window. Yes, it bumped the window out 1/4 inch, but I liked how it a) solved the problem and b) really gave the window some substance. I had the same issue for the doors and used wood strips there too! 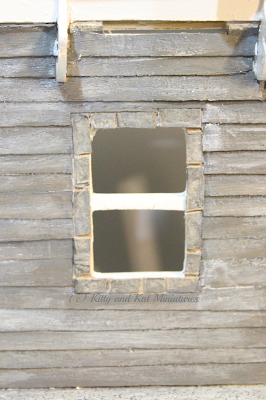 After solving the issue with the thickness of the walls and the depth of the Houseworks windows not matching, I was able to move on to the inside window trim. Inside window trim in place! The Houseworks double working window came with interior trim, but the single, fixed window did not. 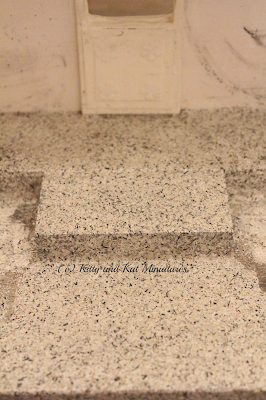 While the trim I had was the correct width, it was slightly thicker. My motto: GOOD ENOUGH. Boom! Done! My good friends at Ikea save the day again! If you are looking for a solid wood base, look no further then the Ikea Ekby Tryggve shelf. 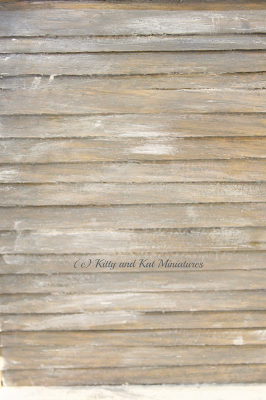 It is a raw pine board in 2 lengths and widths, for under $10. You can't find anything remotely as cheap at a big box store. The same shelf at Home Depot is over $15. 2 edges are already beveled! How awesome is that! And the knots are either wood filled or drilled out and plugged! How crazy is that?? 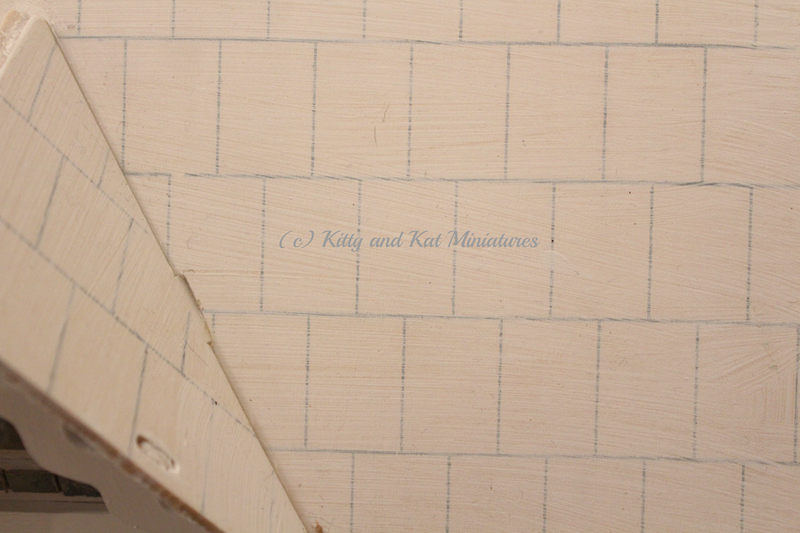 I cut the board to the matching width, but after actually reading the room box instructions before I cut, I realized I needed to leave space on the width for the back wall to see (see photo). 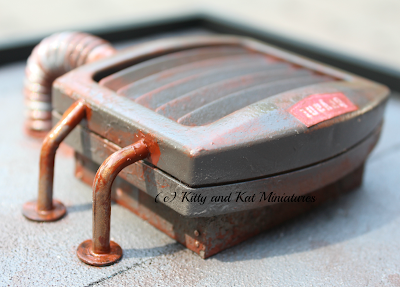 I used LePage No More Nails adhesive and lots of clamps, then left it to set and dry overnight. 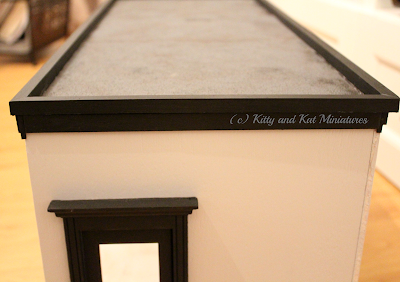 Then I used the same adhesive to fill the small gaps on the edges (like caulking). The walls were glued in place with LePage No More Nails. I marked where I wanted the dividing wall to sit and ensured it was square. I used green painters tape to hold it all together. I like painters tape because its strong but doesn't rip off finishes like masking tape. 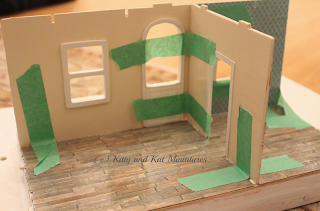 Word to the wise, don't use the Home Depot brand green painters tape, it is thin, it rips and it barely sticks. 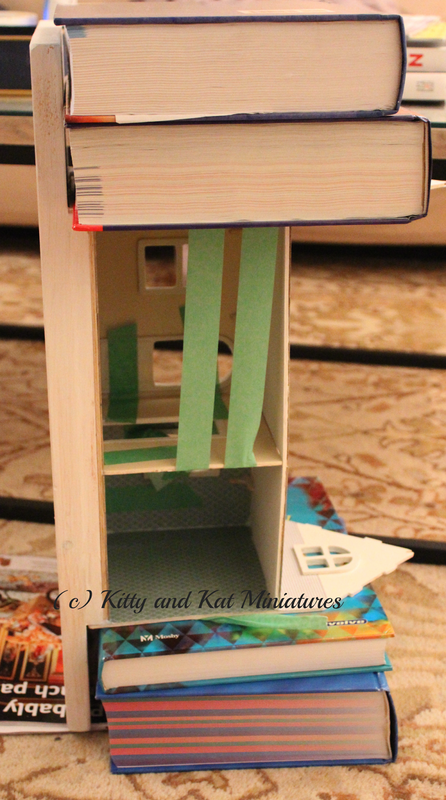 I used books to weigh down the top because the plywood had a few waves to it. I have to say, gluing in the windows before putting the walls up was a brilliant move of un-laziness on my part. To finish the walls, though I didn't take a picture of it, I used regular white caulking to seal the wall gaps and the ceiling gaps. A quick coat of paint and the caulking will disappear. I hate gaps. And then this is where the project went off the rails and I said $%&# it. I decided that this room box would be my dry run at project assembly and techniques. 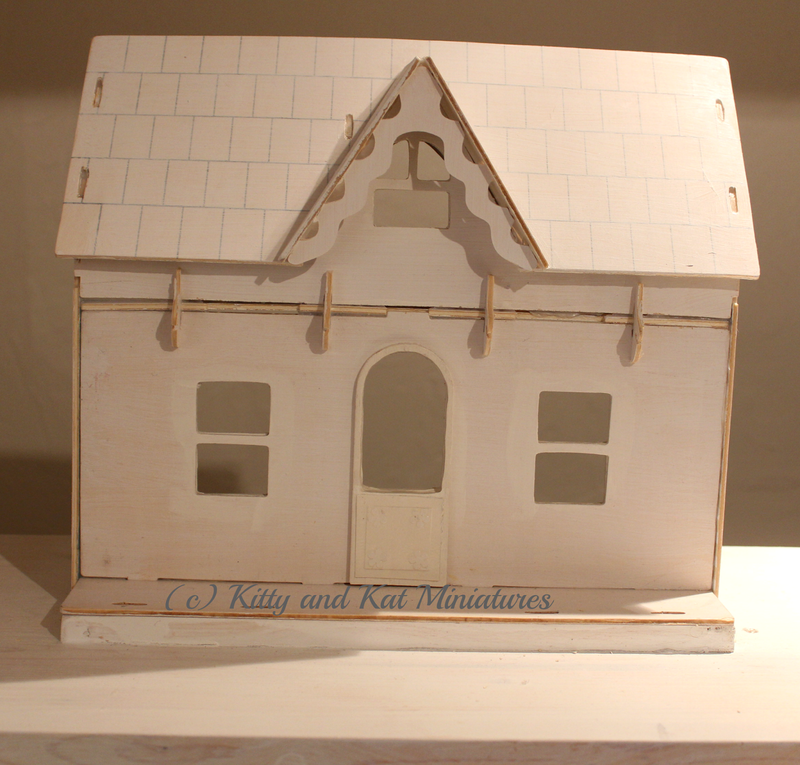 I need something to give me a confidence boost to think of my next project and actually finish Miss Kitty's house. I am now in the zone. Cue "The Final Countdown" by Europe. This tiger is ready to pounce! What I am getting at, is the room box will be like a mini apartment. Nice trim outside, some stone work, house numbers, etc. Nothing crazy inside, but the exterior will give me some practice and help me along with other projects. And, well, its just so much fun! 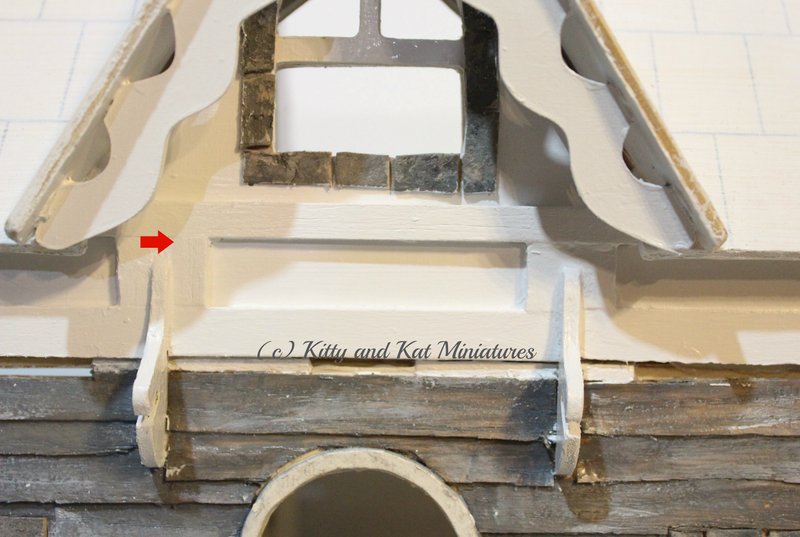 I used the trim that came with the room box (that was supposed to be for trimming the open face of the box), as roof trim. 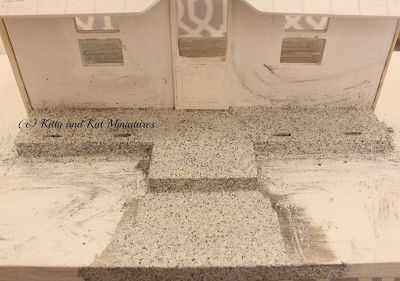 I also used a dowel all the way around as the actual roof line. Another less then a dollar Canadian Tire buy. I stained it my trim colour too. You can't make a roof line and not have a roof, can you? I Googled asphalt flat roofs and struck inspiration. Off to Home Depot I went and grabbed some 60 grit sandpaper. 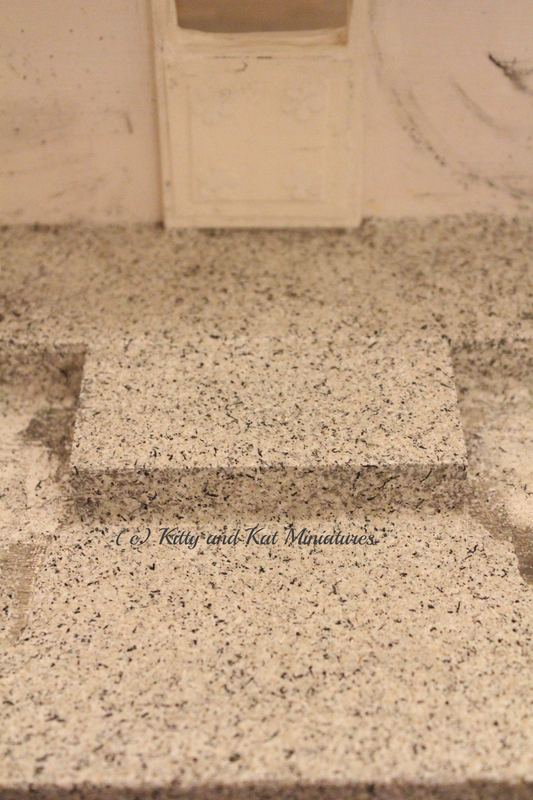 I was going to make all the pieces equal, but in reality, they never are equal slabs, so I went with different sizes. I base painted the sandpaper with "Arrowhead" by Martha Stewart (craft paint). 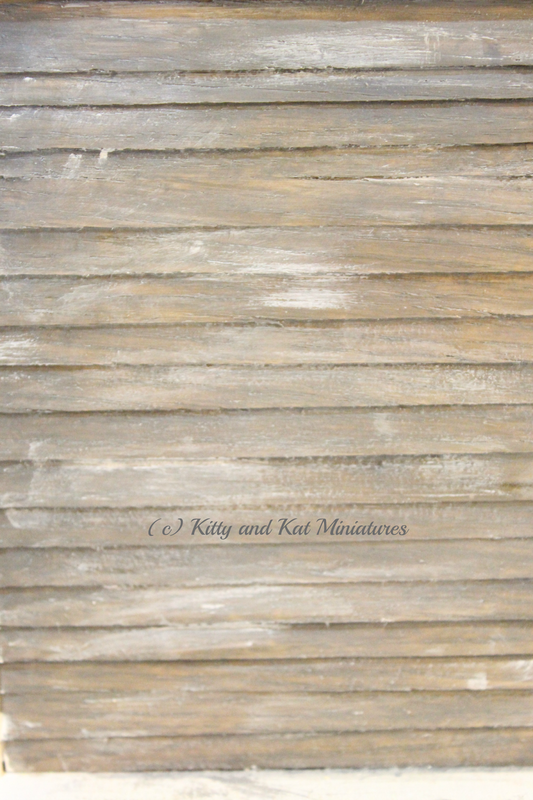 Then I used some grey/brown paint and some of the wood stain to make it "dirty." Ultimately, I am going to add dirt and leaves, but that comes at the end. 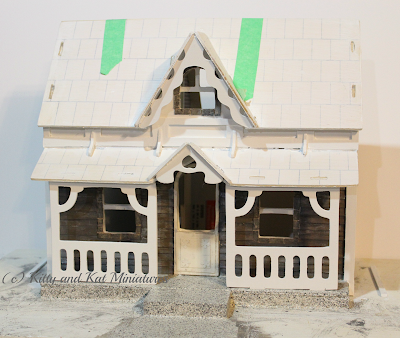 I've just painted some more exterior trim and painted a ton of egg cartons for exterior brick work and made a special project for the roof. Despite all the mini making I managed to complete staining my real life deck and I put new lattice, baseboard and access doors. All this mini making as made me a better carpenter.